Six hikers went on the Smithfield Dry Canyon hike: Jim, Denis, Ryan, Stephanie G, Stephanie T and Alex. The weather was sunny, hot and hazy. When we started hiking, the trail was shaded and cool with a gradual climb. We went by cliffs with near-vertical striations and wondered how they were formed. 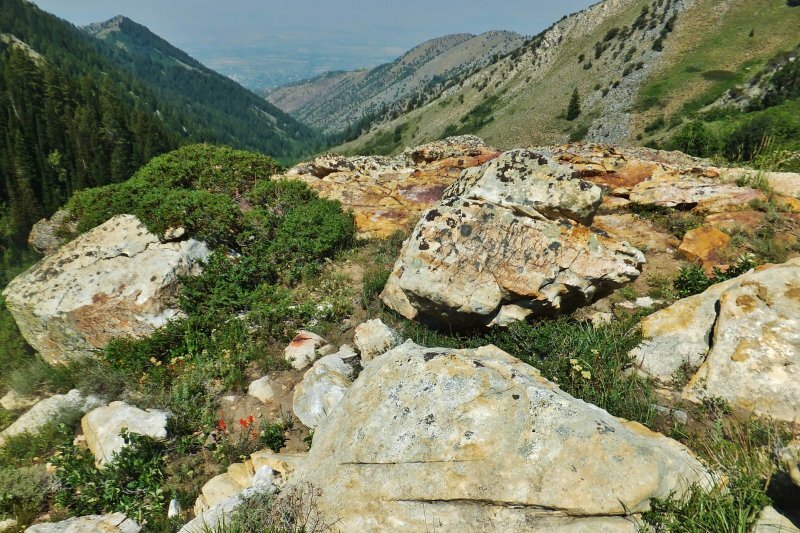 We eventually broke out of the shaded, cool and gradual climb just before Red Ledge Spring. 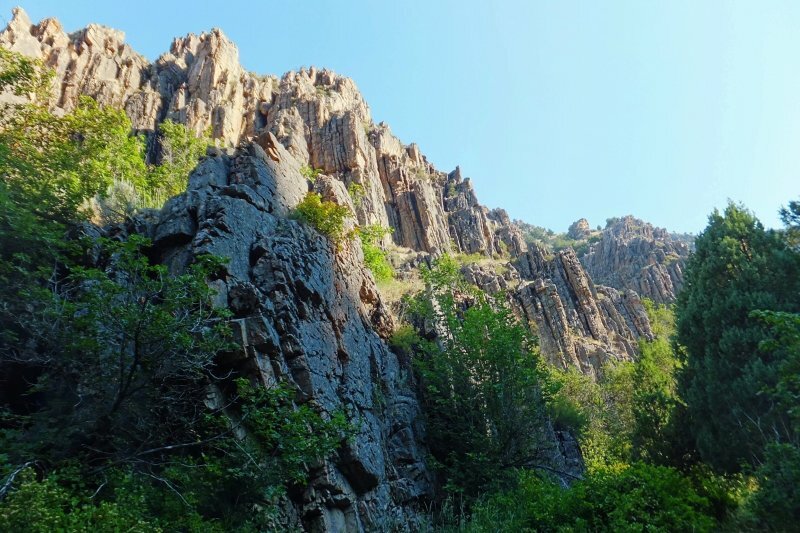 The climb turned steep and hot all the way to our rest stop on the outcropping we know as "Table Rock". We enjoyed sego lilies blooming all around us, a great view down Smithfield Dry Canyon and a not-so-great view of a hazy Cache Valley (caused by smoke from wildfires in the Pacific Northwest). The climb continued steep and hot all the way to the ridge. 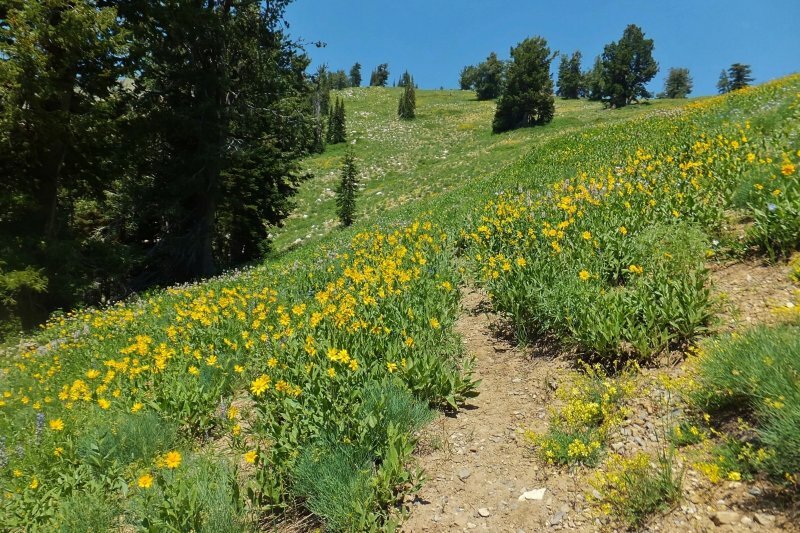 The trail ended just below the saddle in a beautiful meadow of flowers, a Technicolor of little sunflowers, horsemint, scarlet Gilia, Penstemon, blue flax, yellow flax, lupine, Indian paintbrush and among many others. We were also rewarded with cooler temperatures and a steady breeze. 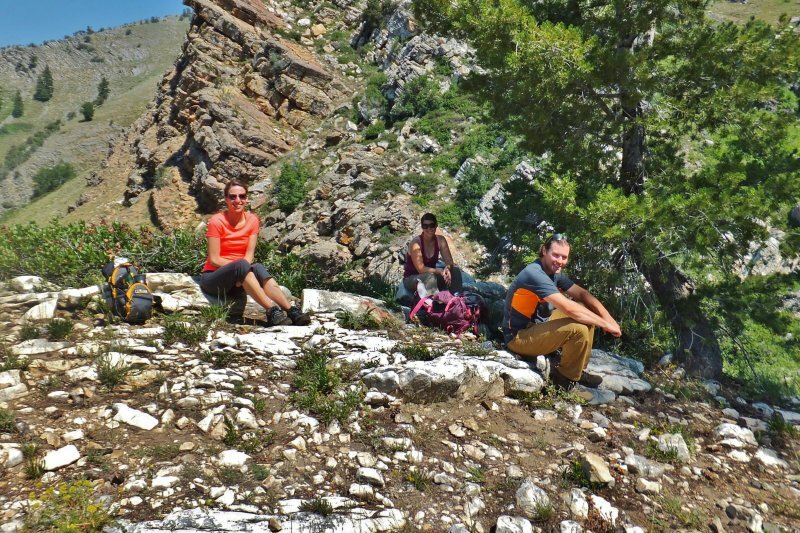 Most of the group had lunch on the ridge overlooking a spectacular view of upper Birch Canyon. Denis and Ryan hiked to Flattop, and Denis went back up for a second trip when Stephanie G wanted to go! We had a hot but fast descent back to the trailhead. Our only delay was a large swarm of wasps at a small puddle on the trail, but we managed to get by without incident. When we arrived at the trailhead, we were all grateful that we did not have to hike another hot mile on the dirt road to the old parking area. We got back to Logan around 4:30 PM. Started from the "new" parking area at the end of Smithfield's Dry Canyon Road (300 S) . This GPS track from 2013 shows the route we followed for this trip.